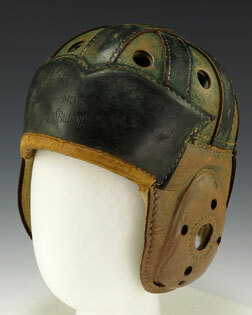 Leather football helmet believed to have been worn by Gerald Ford while playing for the University of Michigan, 1932-1934. The helmet features the Michigan Wolverines logo. The front is embossed, “MOS / Spaulding,” with “Pat'D No 1.864.104” on back.